As it turns out I’m a bit of a homer, and therefore like to collect cars driven by fellow Dutchmen. Of course it helps when they are gorgeous machines like this Alfa Romeo GT am, this Porsche 908/3, this Porsche 934 RSR Turbo, or this newest addition, the Toyota TS010 that finished 8th (5th in class) at the 1992 24H of LeMans. Disclaimer: I know this is a Japanese car run by a half-Japanese, half-British racing team, driven by a Dutchmen, an Italian, and a Brit, but I consulted with French Friday chairman Jobjoris and he said it counted because it raced in France. And the Dutch driver in question? Jan Lammers. Young Jan got his first taste of fame at the tender age of fifteen, when the main stunt driver on the set of the famous Steve McQueen picture “Le Mans,” and Holland’s foremost authority on all things car control (he owns a famous “scid school” where you can learn car control) Rob Slotenmaker boasted about his young protégé Jan Lammers and Steve McQueen invited him to the set to show his stuff. In true sober Dutch fashion, he was taken aback when, completely unsolicited, he got a signed portrait of Mr. McQueen for his troubles. Lammers started racing at local tracks a year later, and after moving to Formula Ford and Dutch touring cars, he won the European Formula 3 championship in 1978. After a somewhat unsuccessful F1 career, he moved on to Le Mans, finally winning the race in Silk Cut Jaguar XJR-9, driving 13 out of the 24 hours, and giving Jaguar its first victory since 1957. 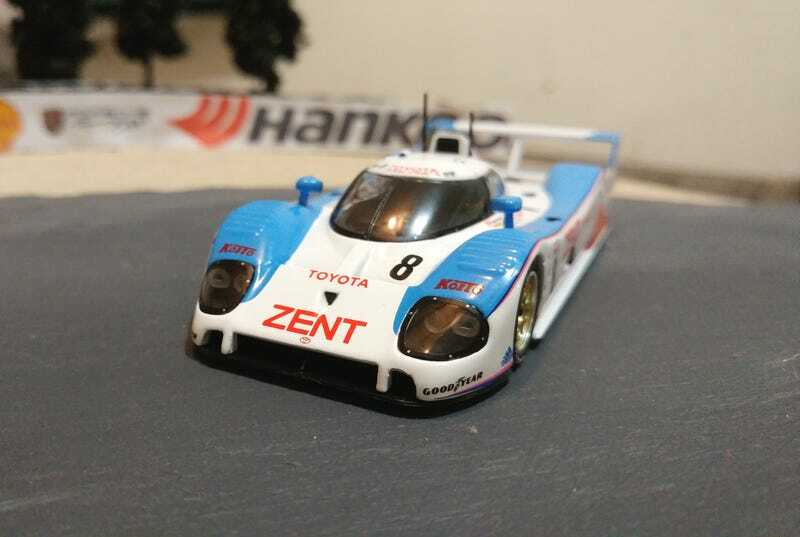 He stayed with Silk Cut for another 3 years before joining Toyota in 1992 in another Tony Southgate designed car, the TS010 shown here, finishing 8th overall (5th in class). I’ve always loved both these cars, with their covered rear wheels and big wings hanging out the back, but I didn’t know they were designed by the same guy. And as I was reading up on him, I found out that he is apparently responsible for a whole bunch of other gorgeous racers, like the Ford RS200 (the chassis, at least), the Jag XJR-12, Ferrari 333 SP, Nissan R390 GT1, and the Audi R8R and R8C. Back to this TS010. After a rule change for 1992 in the World Sportscar Championship Toyota developed a brand new 3.5L V10, and a brand new chassis to put it in. Here is some footage of Toyota testing the TS010, and my GOD does it sound delicious. Toyota actually entered three of them in the 1992 24H of Le Mans, with one finishing P2 overall, the Lammers car finishing P8, and the third earned a DNF. All in all the TS010 raced in ten races, with three wins. Five minute photoshop background FTW!